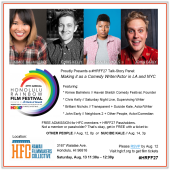 The 27th Annual Honolulu Rainbow Film Festival kicks off on Saturday, August 06 at the Honolulu Museum of Art Doris Duke Theatre and continues every Friday, Saturday and Sunday throughout the month of August. 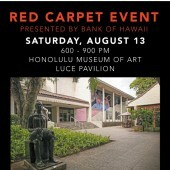 This year, we’re honored to introduce the Bank of Hawaii as our new presenting sponsor! 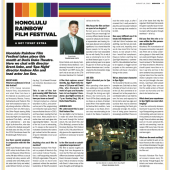 For the past six years, BOH has been a key sponsor of HRFF and we are increasingly grateful for their continuous support of the LGBT community. 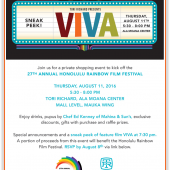 Make sure to get your All-Access Festival Pass today – it’s the only way to guarantee a seat at all of the films, entry to all of the festival parties, and most importantly, admission to our signature Red Carpet Event on Saturday, August 13.